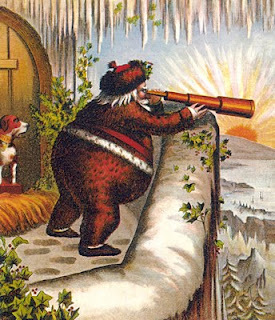 Growing up in the snowy midwest, I treasured the popular image of Santa as a grandfatherly fellow with red and white suit and hat plus a big fluffy beard and huge bouncing belly. The cheerful and bewitching gent held promise of wonderous things to come on the Big Day! It never occurred to me then that he had melting pot origins and looked very different over the many years of his evolution. 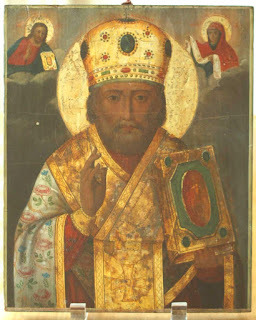 The idea of a kindly religious man giving gifts and the name "St. Nicholas" originated with a 4th Century Bishop from Myra (modern day Turkey). 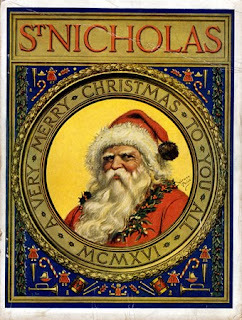 Considered a Patron Saint of children and the poor, St. Nicholas was known for his generousity and for giving anonymously. 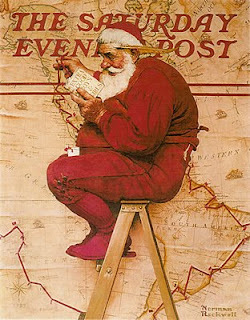 He remained "hidden" as he doled out goodies just like the latter day Santa. 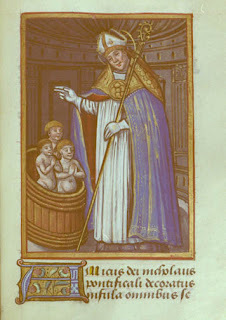 The Bishop died on December 6th, 345 (approximately) and was remembered as a magical figure who mysteriously distributed gifts to children in their homes every year throughout Europe on this day. Each country developed their own version of the myths and traditions surrounding this winter celebration. 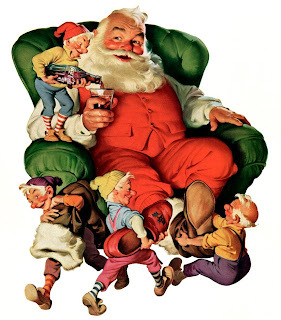 The Dutch name for St. Nicholas was "Sinterklaas", who was also famous for protecting children and giving gifts. 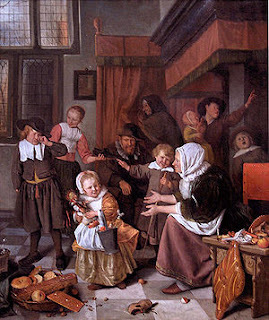 The tradition of children opening gifts from the mysterious saint on December 6th was beautifully captured in the 1663-65 painting, Feast of St. Nicholas, shown here (attributed to Jan Steen). 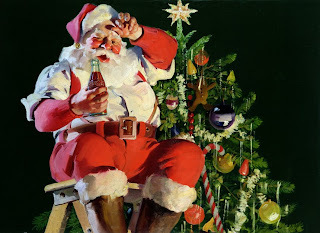 The modern role and image of Santa Claus first came to light in early 19th century America as Dutch, British and American influences came together to create the image that predominates today. 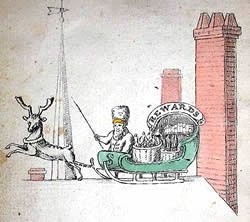 The artwork that follows shows how the image gradually morphed from saintly man into the popular modern image of an elfin figure in a red and white suit, bringing gifts in a reindeer drawn sleigh to drop down the chimneys of good children. 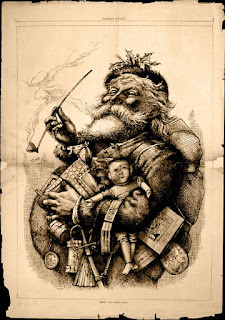 As follows: two 4th Century depictions of St. Nicholas of Myra; a Christmas book, The Children's Friend, 1821; Thomas Nast's famous Harper's Weekly cover, 1861; another Nast illustration from the Val Berryman Collection, Nast-Works; the famous F.O.C. 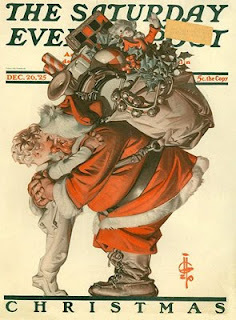 (Felix) Darley cover illustration for Clement Moore's The Night Before Christmas, 1862; St. Nicholas Magazine 1916; a 1925 N. C. Wyeth illustration; a 1925 J.C. Leyendecker Saturday Evening Post cover; another of Haddon Sundblom georgeous 1930s Santas for Coca Cola; and finally one of many beloved masterpieces by Norman Rockwell, this 1939 Saturday Evening Post cover. 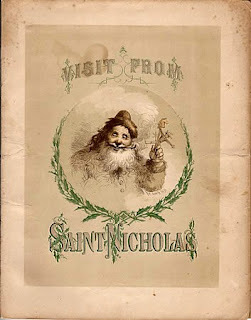 The origins of St. Nicholas/Santa Claus were religious and then he became a popular mythological figure over the centuries, comingled and yet separated from the celebration of the birth of Jesus Christ. He is sometimes maligned as a commercial symbol detracting from the holy nature of Christmas. But, think about the feelings people have at this time of year; their thoughts are about children, goodwill towards their fellow men, sharing, family love, giftgiving, carolling, and so on. 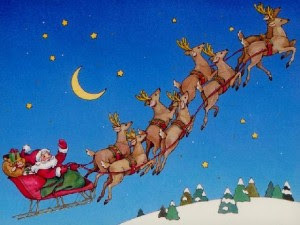 The same good thoughts and feelings engendered by the Santa Claus Legend are basically the same as those called forth by our celebration of the birth of Christ. As always, there's more to the old guy than most people realize. 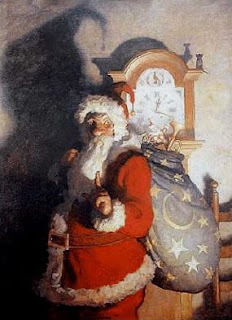 I love the one with Santa next to the grandfather clock, casting that delightfully spooky shadow . . .
Yep ... he definitely looks like he just wandered away from a Halloween party. 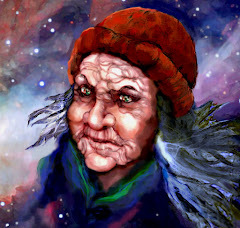 All of these fantasy characters seem to be born of our longing for magical things in our lives. And no worries, we have plenty of those!